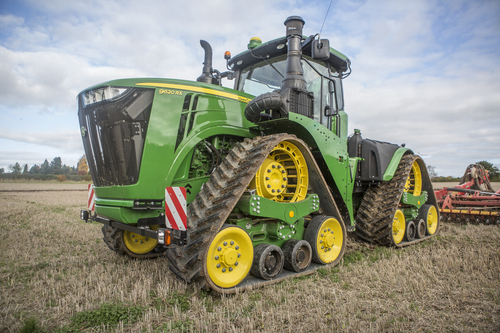 John Deere’s first-ever four-track tractor is making its UK show debut at CropTec 2015. The top of the range 9620RX tractor is being shown alongside the new PowrSpray solution system and the latest AMS FarmSight precision farming developments, together with outdoor demonstrations of the market-leading R4040i self-propelled sprayer. PowrSpray comes as standard with Auto Filling, Auto Agitation Intensity control (where the tank agitation intensity decreases as the solution tank level lowers), Power Agitation (for maximum intensity agitation of difficult to mix products), Active Pause for stress-free chemical filling and the unique Auto Dilute rinsing system. R900i Series PowrSpray machines can also be optionally equipped with John Deere's automatic Section Control and BoomTrac auto boom levelling systems.